Discover the zesty taste of our Healthy Living Grilled Fish and Peppers. A quick marinade and red pepper are the secret to our Grilled Fish and Peppers. Mix dressing and crushed red pepper. Pour over fish and peppers in shallow glass dish; turn fish and peppers over to coat both sides of each with dressing mixture. Refrigerate 15 min. to marinate. Heat grill to medium-high heat. Remove fish and peppers from marinade; discard marinade. Grill fish and peppers on covered grill 4 min. ; turn fish over. Grill, covered, 2 min. or until fish flakes easily with fork. Place fish and peppers on serving plate. Sprinkle with cheese and cilantro; let stand 3 min. Never refreeze fish or seafood, whether fresh or frozen, once it's been thawed. Store in the refrigerator, tightly wrapped or in an airtight container, for no more than 2 days. 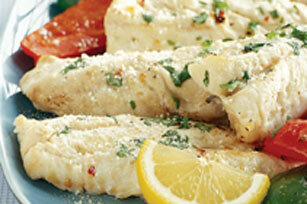 Prepare using other firm white fish fillets, such as halibut or tilapia.